Creating fire proof housing to resist Australian bushfires would be of great value in many areas. The CSIRO now tests a steel-framed house. The house with steel frames was set up with a series of gas burners aimed at its facade to simulate a raging bushfire front. While the temperature in the home would have been too great to survive due to the failure of windows and doors, the home remained standing and the frame was relatively undamaged. CSIRO’s Justin Leonard reports to Catalyst that “There doesn’t seem to be an indication that a lot of heat has come through the wall itself”. We look forward to the next test, which will hopefully produce a house that can be survived in throughout the duration of an otherwise devastating fire. 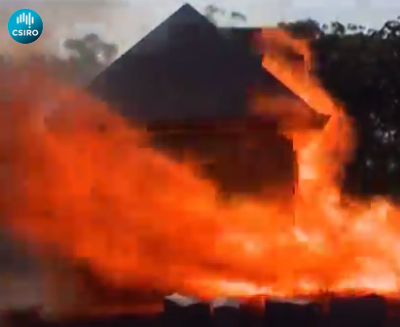 Watch the following videos from CSIRO and ABC’s Catalyst to see the full test.